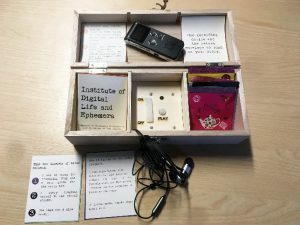 In the summer, our research team started the Storytelling with Objects project and began a design session to create a set of storytelling artefacts. Our team held a design workshop on 6th June 2017 at the Mixed Reality Lab in the School of Computer Science, University of Nottingham. Together with transmedia practitioners, we explored several prototype ideas and discussed potential dissemination options. 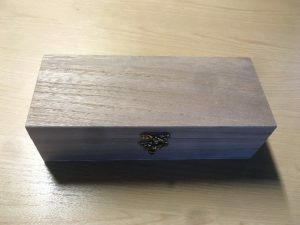 Among many bright ideas that emerged throughout a month-long brainstorming exercise, we became fascinated by the idea of making a bespoke wooden box containing several elements relating to storytelling practice. We decided to create a background story world to explain why we had created the box and why we were asking storytellers to send us their stories. We named our team IDLE: Institute for Digital Life and Ephemera. Below is a brief of the background story. Figure 1 shows the Storybox that was made from an ordinary tea box. Figure 3: Middle column with the playback device shown. Inside the box, there are three separate columns. We designed instruction cards to introduce IDLE and how to manipulate the box in order to listen to the story and record their own story. Details of the box are shown in Figure 2 (top right) and Figure 3. The box contains instruction cards, the playback device (in the middle column), and four bags of English tea. Also, the detachable recording device is included that will be sent back to IDLE. The first set of boxes was sent out at the end of September, to three storytellers in England. 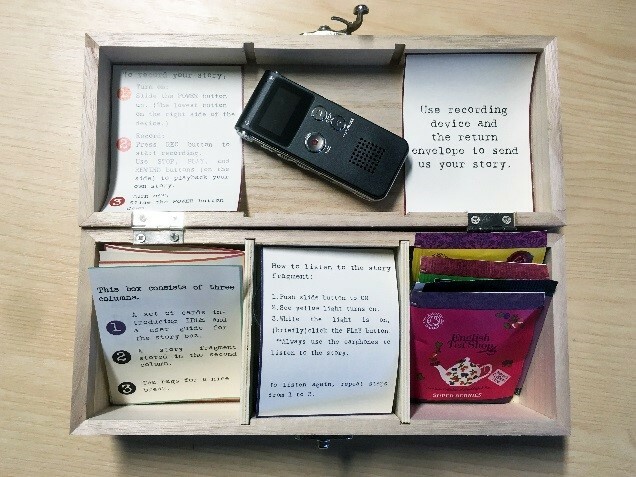 We are hoping to receive some captivating stories in an envelope (also provided in the Storybox) as shown in Figure 4. When the first set of the stories return, we will release the next boxes to the US, across the Atlantic Ocean. 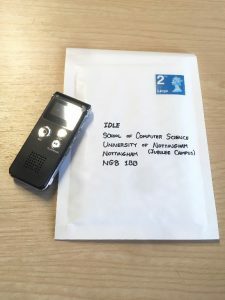 Figure 4: A return envelope enclosed in the Storybox for storytellers to send us their story with the recording device.